Menorca is the least known islands of the Balearic. As the origin of its noun says (Minorica), it is smaller than its bigger sister Mallorca (Majorica), but it has a lot to offer. It is especially recommended for nature lovers, since it was designated by UNESCO as a biosphere reserve and it managed to resist the construction boom of the last decades. Even inside Spain, it only started to become more popular recently, not only due to friends sharing awesome photos on social media but also because of ads like this one. What can you do and see in this paradise of the Mediterranean Sea? If you want to discover the real Menorca and not just stay in an all-included hotel, the first thing you will have to do is to rent a car (or a scooter). The towns are fairly well connected by public transport, especially Maó and Ciutadella, the two main poles of the island. However, in order to get to the best beaches as well as to other must-see attractions, having your own transport will be very convenient. Make sure you book it well in advance; in particular in peak-seaon it can be very difficult to find vehicle at the last minute. Should I rent a car or a scooter? This question arises very often when planning a trip to Menorca. There is not an absolute answer: each has its pros and cons. With a car you get air-conditioning and a trunk to store all your stuff. With a scooter you will have no problems finding parking spots at any beach, but you will lack storage room and cold air. Getting to certain beaches with a scooter can get tricky, since a few roads are not paved. Driving a scooter is generally less safe than driving a car. Ciutadella was the former capital and is still one of the most beautiful places in Menorca. The old town is very well maintained, with charming narrow streets and small shops. The harbour is full of restaurants and terraces where you can enjoy a lovely dinner and a drink. Ciutadella Harbour and Town Hall at night. Photo by Andrés Nieto Porras on Flickr. At the other side of the island lies the capital of the island: Maó or Mahón. It hosts one of the largest natural harbours in Europe. You can have a very nice walk along the harbour and will find plenty of restaurants and bars. In summer there are glass-bottom boats that take you around the harbour while explaining the history of the place. Fornells is a fishing village at the north of the island. It is very well known for its lobster stew ("Caldereta de Langosta"), one of the most beloved dishes in the island. The former Spanish king used to go there every summer to enjoy one of them. Expect to pay quite a lot of money, though. Otherwise, you can just walk around the village, enjoy its atmosphere and eat any other more affordable dish. Fornells is also a good place to rent a kayak and paddle for a couple of hours in its sheltered bay. This small village represents a fishing village with impolute white houses and very narrow streets. It's a very picturesque place, perfect for some photographing. Photo by Chris Slupski on Unsplash. Sa Cova d'en Xoroi is a bar located in caves at the top of a cliff. It is a unique place, and as such an entrance fee is required (drink usually included). The amount to pay will vary depending on the season and the period of the day. During the day it is cheaper, at sunset it is more expensive and at night it turns into a disco and the prices go even higher. You can check the details on the official website. Do not expect to see the sun setting into the horizon during July and August, since it will set behind the cliffs. Es Castell is the most eastern village in Spain, meaning it is the first one to see the sun rising. Its main attraction is Cales Fonts, a small lovely harbour inside the port of Maó. There are plenty of restaurants where you can have a nice dinner. During the evening you can also find many stands selling hand-made bracelets and other sorts of accessories and souvenirs. Cales Fonts at dusk. Photo by Cervusvir on Pixabay. Start the evining visiting the Blue Sky Bar, which is the roof-top terrace of the Barceló Hamilton Hotel. After paying the entrance fee you get access to the top, where you can enjoy drinks, jakuzzis and breathtaking views to the entrance of the Port of Maó. Relax while your wait for the sunset and enjoy the views to most of the port. Afterwards move to Cales Fonts for some shopping. Have dinner at one of the many restaurants there. Next to Cales Fonts, almost as a prolongation, there is "Moll d'en Pons", where you can chill and have a drink. To finish the evening, if you still have energy, you can move to the other small harbour of the village, Cala Corb, where you will find Es Cau, a decades-old popular bar among locals where the owner and guests play the guitar and sing traditional Minorcan and Spanish songs. Menorca has plenty of talaiotic monuments that were built during the iron age and are considered of great historical value. Torre d’en Galmés, at the road from Alaior to Son Bou. Both have signs with historical explanations in different languages. There might be a small entrance fee. Prehistorical Taula. Photo by IsabelPerello on Pixabay. Without any doubt, this is one of the most interesting cultural attractions of the island. The guided tour takes four hours. Apart from learning about its history and seing the fortress itself, you get some wonderful views of the Port of Maó. Menorca is not the destination you are looking for if you want crazy parties every night. However, in summer there will be almost every weekend a local festivity in a village or town of the island. Their main components are horses and Gin Xoriguer. 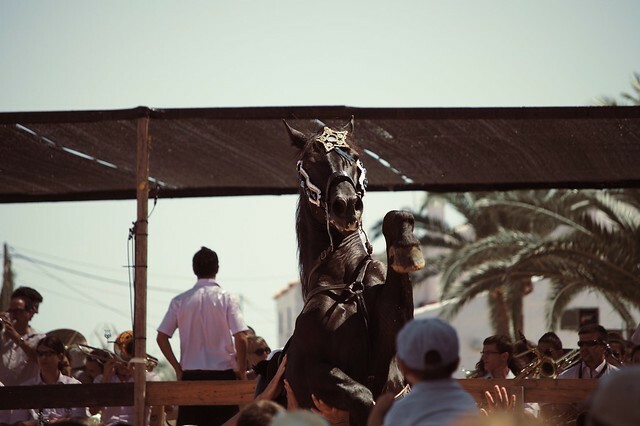 Check out the calendar for the Menorcan festivities here. Do not dress up for such a party! Take instead comfortable clothes and shoes that protect your feet. It can get crowded and you do not want somebody or even a horse stepping onto your foot wearing just flip-flops. Locals wear simple T-shirts, shorts and old sneakers. Traditional Jaleo in the Fiestas. Photo by jcsogo on Flickr. Monte Toro or "El Toro" is the highest point of Menorca. It is just about 360 meters high, but in a clear day you can get a unique view of Menorca. If it is especially clear, you might even see Mallorca at the horizon. At the mountainside lies Es Mercadal, a beautiful village well known for its typical pastries like the "amargos". You can also find there some good restaurants serving traditional Menorcan dishes. There are three lighthouses that offer breathtaking views, all of them on the north coast. Cavalleria is a cape in the centre part of the island. It has a lighthouse that offers one of the most amazing sunsets you might ever see. Sunset from Cavalleria Lighthouse. Photo by jplenio on Pixabay. Punta Nati is at the west side of the island, close to Ciutadella. Its surroundings are very special landscape that you will not find anywhere else in Menorca. This makes it also for very wonderful sunsets. Punta Nati Lighthouse. Photo by ayoubetmaiti on Pixabay. Favaritx is popular due to its moon-like landscape that makes it unique and a dream for photographers. However, it is not appropriate for sunsets because of its orientation facing east. As of summer 2018, the regional government decided to restrict the access by car for the peak season, so before going there make sure to check if car access is allowed or if you need to take a bus. Favaritx Lighthouse. Photo by ayoubetmaiti on Pixabay. If you want to walk in the nature, there is a path called "Camí de Cavalls" (the Path of the Horses), which surrounds the complete island. That is 186km, which maybe could be too much. If you don't feel like it is too much, you might be interested in running the Trail Menorca Camí de Cavalls or booking a tour in stages with Camí de Cavalls 360º. For the rest us, it is good to know that the path is split in stretches, so you can do just one or two of those on your own. Path of Camí de Cavalls. Photo by lidiavaq on Pixabay. Menorca has many beaches of all sorts, some of them often included in lists of most beautiful beaches in Spain and Europe. Before we start with our own list, a very important piece of advice: do like the locals and check the wind forecast in any website or app before deciding where to go that very same day. The wind can totally change your experience in the beach, mainly because it can make that the sea is not as crystal-clear as you expect. Also, it might push jellyfishes to the shore. If the wind blows north, go south. If the wind blows south, go north. Luckily, Menorca has more beaches than Mallorca and Ibiza together, so there are plenty of beaches to choose from. Since beaches in the north and in the south also look very different, the list will be split in two. Most of the pictures of beaches from Menorca will be from the south. These offer white super-fine sand, turquoise waters and are surrounded by pines. Cala Macarella and Cala Macarelleta are probably the most famous beaches and consecuently they are packed in the peak season. However, it is for a reason that they are so famous, the sea has an amazing turquoise color here and the cliffs around provide wonderful scenes. As of summer 2018, the regional government decided to start restricting the access by car during peak season, so make sure to book bus tickets in advance. If it is too late for that, no need to worry! You still can make it by walking a bit. Park your car in Cala Galdana, which is 4km away (one hour walking) through the Camí de Cavalls. Cala Turqueta is also one of the famous beaches in Menorca, usually in the top-5 of any list. Parking places are very limited and once it is full you are not allowed to even get into the last segment of the road. During peak season, make sure to go very early, as the parking can be already full at 9 a.m. or even sooner. Cala Turqueta. Photo by Xavier Marquès. Cala Trebalúger is an unspoiled beach often forgotten. Acces to this beach is not easy, which ensures that the beach will not be crowded. It is about 1-hour walk from the parking at the entrance of Cala Galdana. Being an unspoiled beach there are not any facilites there. You will need to bring your food and beverage, as well as umbrellas, etc. Your reward will be a wonderful beach with plenty of space. Alternatively, there are some boats that take groups of tourists to the beach, stay for 15-30 minutes and then go away as fast as they came. View of Cala Trebalúger from the cliffs at the east side. Photo by Travelinho. Binigaus is one of Menorcan's favorite beaches. It has a good compromise between easy access and nature, free of any buildings behind the beach. You get there driving thourgh the village of Es Migjorn Gran and parking at the entrance of Sant Tomàs. From the parking place the beach is fairly easy to reach, about 10-15 minutes walk. Storms take away or give sand to the beach at their will. In case it does not have that much sand, the first part of the beach will have disappeared, so the beach will not be that long anymore. How to know if the beach has plenty of sand or most of it is just rocks? We finish the beaches in the south with Cala Galdana. It is surrounded by high cliffs, which makes it a good option even for very windy days. It has plenty of hotels, restaurants and many more facilities, so it feels quite different from the other beaches suggested above. From Cala Galdana you can take a boat to visit the unspoiled beaches nearby or you can even rent a kayak and paddle by yourself. Cala Galdana. Photo by AitorMorgado on Pixabay. The beaches in the north are quite different from the south, but equally beautiful. Due to the strong northern winds there is usually low vegetation, but no trees. The sand is thicker and its color is brown or even redish. In calm days, the sea is extremely clear. Cala Pregonda is in the top 3 of many locals and for good reason. It has two beaches almost facing each other; only separated by a cliff that is a perfect location for photographers. In addition there is a small island in the middle of the bay, providing protection and making the sea very quiet. In order to get to Cala Pregonda you will have to drive until Binimel·là, park there and walk for 30-45 minutes. The walk is without shadows, so make sure to get early or protect yourself properly against the sun, especially during the summer. Its main inconvenience is that jellyfishes seem to like this beach very much, so there is always the risk of going all the way only to find out that you cannot swim. The best chance to avoid this from happening will be when the wind is coming from the south. However, this is not an exact science. 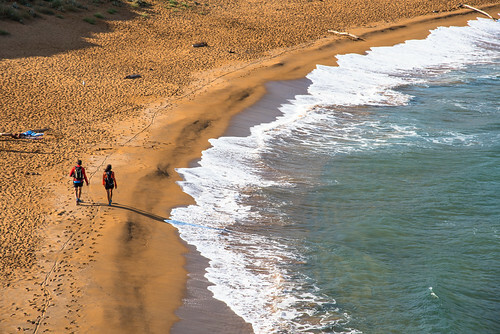 Who wouldn't love to visit this beach on the weekend? It is #CalaPregonda in #Menorca ☀️🏖️❤️ Have a nice weekend! This beach is close to the lighthouse with the same name. It is only a 5-10 minutes walk from the parking place. The access is very easy and there are even wooden stairs to go down from the cliff. The water can be super clear when it is calm. You will see many people with a layer of red mud on the skin. This is taken from the cliffs and it is said to be a natural treatment. However, this practice damages the environment due to the erosion it causes, so we discourage it. Cavalleria beach on a windy day. Photo by Roberto Faccenda on Flickr. Platges d'Algaiarens, also known as La Vall, are a couple of beaches located at the north of Ciutadella. There is a big parking place 5 minutes away from the beach, which makes it very convenient. Located in the area of Favaritx, this is an unspoiled beach with views to the lighthouse. Despite being in the north, the sand is white and fine. See the explanation about Lighthouses to know about any possible access restrictions. This is by no means an extensive list and many great restaurants might be missing. However, we tried to put together a small list to give some ideas. Restaurants tagged as Local fave ✶ mean that they are favorite among the locals due to their good price/quality ratio. However, this might mean there is nothing fancy in it and that the location is not special, it is just tasty food and good service. La Cayena: Warm and efficient service. If you fancy a change from the dishes served in most of the restaurants, here dishes from all around the world are served. Cuk-Cuk Restaurante: Tripadvisor's #1 in Ciutadella, as of August 2018. They prepare nice traditional Menorcan and Spanish food, including paella. You can also learn how to cook a paella yourself! Fang i Aram: good vegetarian restaurant in Ciutadella. Sa Nacra is a restaurant in the residential area of Santandria. Its terrace is just next to the sea, offering wonderful views. It offers very good food, including paellas. Local fave ✶ Taps Can Avelino offers fantastic tapas at a good price. Clorofila: good vegan restaurant in the city center. Sa Gavina II Port: small restaurant in the harbour with very tasty food and a friendly owner. Local fave ✶ Can Manolo: Many locals order sandwiches to take away here when going to spend a day to the beach. Ready to try a typical meatballs sandwich? Sa Barqueta: nice tapas and friendly staff at a good price in Cales Fonts. They have Menorcan beer in stock. See Reviews on Tripadvisor. If your order tapas, include one of sausages and one of chicken strips. Local fave ✶ Can Los is a typical local place. Definitely not fancy, but it serves traditional dishes and fresh fish at competitive prices. It is a good place to try the caldereta (lobster stew). El Chivito is probably the most famous place for sandwiches in the island. It is located in Cales Fonts and has very competitive prices. Local fave ✶ Bar Restaurante España offers tasty daily menus (starter, main dish and dessert) at a competitive price, which is why it is very popular among locals. Tip: Apart from the daily menu, the Langoustine with American sauce is a star dish. As a dessert, the Soufflé is just delicous. Ca Na Marga is a high quality restaurant located at the entrance of Fornells, an area called Ses Salines. Meats are their speciality, although fish is also good. Deserts are just to die for. Do not expect to pay less than 40€ per person. Binifadet: a winery with its own restaurant. The atmosphere is very pleasent and they offer also guided tours. See Reviews on Tripadvisor. Cala Torret: a small coastal village that has many restaurants with elevated terraces next to the see, offering a wonderful view during your lunch. Specially convenient if you happen to be in the area visiting Binibeca or any of the beaches around. Molí d'es Racó serves delicious traditional Menorcan dishes at a very reasonable price. Ca n'Olga is a traditional Menorcan house converted into a restaurant. It has a pleasent atmosphere, especially in its backyard's terrace. Tip: The cod with alioli is just delicious, but you can't go wrong with any choice. Gin Xoriguer is a gin produced in Menorca and widely consumed during the local fiestas. It has won some international prizes due to its unique flavour. This uniqueness makes that even people that do not like gin actually enjoy this one. It is usually mixed with lemonade, and the mix is called in most part of the island "Pomada". You can buy Gin Xoriguer pretty much everywhere, including supermarkets. If your bagagge is full you can even buy it at the airport after the security control. The avarca is a footware traditionally produced and used by peasant farmers using car tires. In the last years it has become very trendy and you can see people wearing them anywhere in the world. You can find them in many shops, but make sure they have the stamp "Avarca de Menorca". Alternatively, you can go directly to the factories where they are produced. Old avarcas. Photo by JoanMM on Unsplash. Did you know that the original Pretty Ballerinas come from Menorca? What a better place to buy a pair of them than in their own island? The factory can be found in Ferreries. Menorca is known also for its cheese production. Mahón cheese, despite its name produced in all the island, has the certificate "Denominación de origen", which ensures the quality and geographical origin of the finest products in Spain. The cheese is saulty and comes from cow's milk. There are mainly three kinds of cheese: young, middle (semi-curado) and aged (curado). If you prefer sweets you can buy pastissets, flower-shaped biscuits typical from Menorca. Menorca has many different sausages produced from parts of the pork. 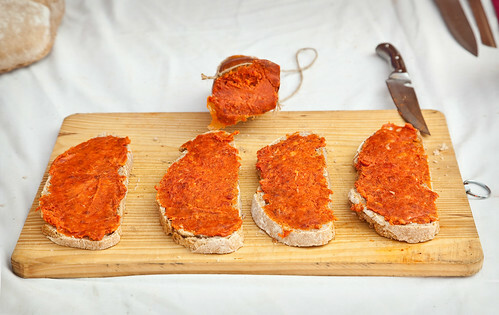 The most well-known is probably sobrassada, typical in Menorca and Mallorca. Others are "camot" or "cuixot" and "carn-i-xulla". Sobrassada with bread. Photo by Juan Antonio Capó Alonso on Flickr. We hope you found the post useful. If so, feel free to share it!